A group of cute but funny looking Scottish Highland Cows in the Dunvegan Castle gardens in Scotland, Europe. The funny looking Scottish highland cattle looking curiously while having their photograph taken in the Dunvegan Castle gardens. Despite their funny looks these cows are quite aggressive and can de dangerous for unwarned visitors. 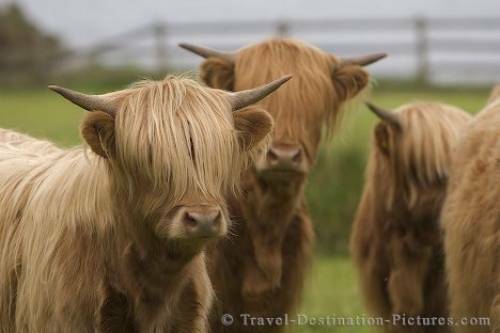 Picture of cute long-fringed cows in the Isle of Skye, Scotland, Europe.